You’re a capable, competent person. Frankly, you’d probably do just fine installing your own door locks. However, we want to caution you. We support the DIY mentality 100 percent. 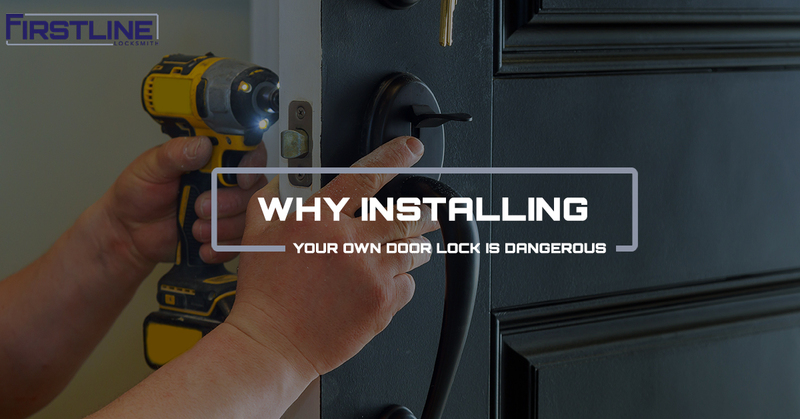 Nonetheless, there are a few potential dangers to installing your own locks that we want you to be aware about. In this post, we will share with you those dangers and offer some insight on why hiring a local locksmith in Newark is your best choice. There are a few benefits to installing your own door lock. The first is time. You will spend less time throughout the entire process. You won’t have to call a professional locksmith in Newark to take care of your need. In most cases, you will save a few dollars doing it yourself. One of the big motivators behind DIY projects is the money saved. With these two benefits to installing the door lock on your own, let’s now consider the dangers. Although you’ll be saving time and money installing your own door lock, you will be sacrificing security and freedom. First, a professional locksmith will be knowledgeable in which type of lock will work best for the type of door and doorway it’s being installed into. Furthermore, a local locksmith in Newark will be acutely aware of the crime rate in the area. They will be able to advise you how serious you need to get with your home security. When you install your own door lock, you can spend the time to do the research, but how much of that time could have been saved by simply hiring a reliable professional? Second, the freedom to feel assured that your door locks are properly installed and functioning to protect your family is a priority. When a professional locksmith takes care of your lock installation or entire home security system, you can rest assured that it’s done correctly. Frankly, we would strongly suggest you do your due diligence and research the local professionals to find the best locksmith for your project instead of installing your own lock. If you’re willing to trade time and money for security and freedom, than proceed with installing your own door locks. Otherwise, Firstline Locksmith is here to help. We’ve served Newark and the greater New Jersey area for years with the highest quality locksmith services in the region. Each and every customer has specific needs that are different from all our other customers. Two customers with homes side-by-side could be scheduled for a lock replacement on the same day, and we will work with them to determine which locks work best for their homes. In most cases, the type of lock and services we provide these two “similar” customers will be wildly different. Do you you have locksmith questions? Have you searched online for a specific issue but you cannot find the answer? A local locksmith in Newark is able to address your concerns and answer your questions related to locks & locksmiths. On the other side of the same coin, locksmiths are able to educate customers on how to keep their families and businesses safe with door locks, window latches, security upgrades and more. It isn’t a one-way street when it comes to locksmith services in Newark. At Firstline Locksmith, we strive to foster a professional relationship with those in our community, so that we can all live in harmony. At Firstline Locksmith, we provide more than door lock services for residents in Newark. We provide an entire collection of residential locksmith services. Furthermore, we work in various commercial industries, as well. This means that we can help our customers comprehensively compared to the DIY approach that focuses on one problem within a hyper-specific context. Firstline Locksmith has been serving Newark and the greater New Jersey area for years. Our mission is to help our customers, whether residential or commercial, secure their loved ones, colleagues, assets, and more with excellent locksmith services. As one of the few fully licensed, insured, and bonded locksmith companies in the region, we’re here to stay. Ready to get that door lock installed? Want Firstline to assess your office building security? Contact us today!